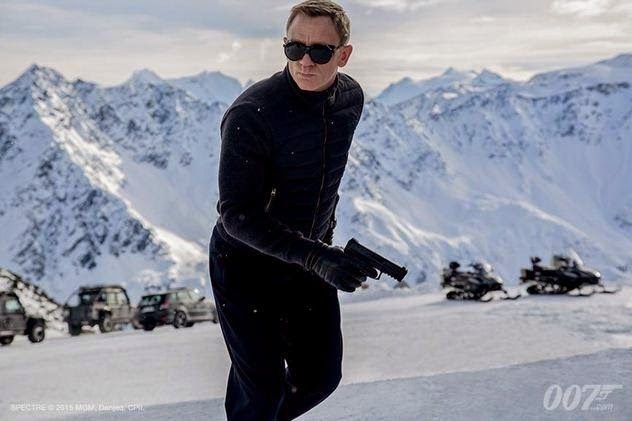 You, Me and Movies: Will 2015 Be The Year of the Spy? Do you see the picture above? That is our first official photo from the "Spectre," the twenty-fourth James Bond film and the fourth film starring Daniel Craig. This James Bond film in particular is going to be extra special. "Spectre" isn't just some clever name for a movie, it is the name of a iconic terrorist organization that Bond has battled on the screen and within the pages of literature since the creation of the character. The groups leader, Ernest Blofeld, is to James Bond as The Joker is to Batman. Seeing this brand new rendition of Bond's greatest foe in this new direction of the franchise has me and several other Bond fans extra excited. If this were the only spy film we were getting this year, it would be enough to be happy about. But we are getting more than one spy film this year, heck we are getting more than three. We have "Kingsman: Secret Service" opening this weekend, and I am going to work tooth-and-nail in order to see this film sometime this weekend. I can't wait to see it and I am curious to see what the rest of you think of that one. "Kingsman: Secret Service" wasn't based on any type of show which reacted to Bond, it was based on a comic book, which I am now furiously curious to get my hands on. I have already read good things about the film already. It has been a big week for spy films in general. Not only did we get our very first photo of the becoming Bond film and not only is "Kingsman: Secret Service" opening tomorrow, but we got two trailers last night. These trailers were for "The Man From UNCLE" and "Hitman: Agent 47." I did not know this, but "The Man From UNCLE" was apparently a famous show that got some coverage during the early years of the James Bond franchise, and an updated movie will be released later this week starring Henry Cavill and Armie Hammer. It looks like it could be great fun. "Hitman: Agent 47" isn't a spy story, per se. But I think there are some clear tropes and inspirations from that particular genre that can't be ignored. Hollywood tried adapting "Hitman" from a video game to a movie back in 2007, with mediocre results (if you ask me, that is), so I am not sure how personally excited I am, but I suppose I will give it a try. If this all isn't enough to satisfy your appetite for the spy genre, don't forget we are getting "Mission: Impossible 5" around the time we get "Spectre" (November-December range, holiday time!) and while there was a long stretch of time when I wouldn't be excited by a "Mission: Impossible" movie, I think the work which was done on "Ghost Protocol" set a new standard for the franchise, and I am patiently anticipating the fifth entry in the series. We are also going to get "Spy" a new comedy starring Melissa McCarthy, but I don't know enough about that one yet to know if we should be excited or not. No matter, what I do know is that we are going to see a wide range of styles and inspirations in the genre, and I wonder which ones will be good and which ones will be great. Every once in awhile, we get a year that marks a certain high for a certain type of movie. In 1990, "The Godfather" series ended with its third part, but that year also gave us "Miller's Crossing" and "Goodfellas" which reimaged the standard for gangsters on film completely. The year 2008 was the year we learned that superheroes on film proved their resilience and their longevity, it was the year when superheroes really became commonplace like they are today. Now, we could be getting another defining year, but this time in the world of spy films. As a lifelong fan of the spy genre, I can't wait for what this year has in story for this little sub-genre, and by this time next year, I hope we are singing the praises of everything this genre granted us in 2015. I hope you are too.